A British bank has denied reports it closed the UK accounts of RT, Russian state TV's international channel. NatWest said a letter had been sent to one of RT's suppliers, not RT itself, and no accounts had been frozen. RT says that the "supplier", Russia Today TV Ltd, provides all RT services in the UK. It told the BBC that NatWest is the sole banking facility for Russia Today TV Ltd. 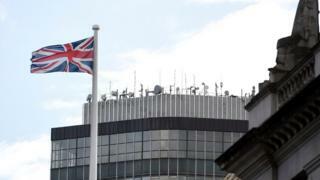 The Russian embassy in London says it is an "openly political decision". But the UK Treasury said no new sanctions or obligations relating to Russia had been imposed on British banks since February 2015. The UK joined other EU states in imposing sanctions on Russia following its annexation of Crimea from Ukraine in March 2014. On Monday, RT's editor-in-chief, Margarita Simonyan tweeted that "all" the channel's accounts in Britain had been closed. The TV station says the supplier is the local production company that, amongst other things, handles RT staff salaries. Late on Monday, NatWest appeared to backtrack on its decision, announcing that it was reviewing the situation. NatWest has refused to comment further and has not explained what led to its original decision. In 2015 Barclays bank closed an account connected to another arm of Moscow's state-funded news services. On Tuesday RT published a letter on its website reportedly sent by NatWest and addressed to "Russia Today TV UK Ltd". The letter explains that the Royal Bank of Scotland Group (RBS), Natwest's parent company, will no longer offer its services, and all banking services and accounts will be closed by 12 December. In a statement, the Russian embassy said "unbearable conditions" were being created for Russian media, making their normal functioning impossible. "Silencing these news outlets is a blow to the principles of freedom of expression, allegedly cherished in Britain," it said. RT has breached the UK's broadcasting code at least 10 times over the past decade and has been put on notice by communications watchdog Ofcom, which warned that further impartiality breaches could result in a fine. In one programme, RT accused the BBC of "staging" a chemical weapons attack for a news report on Syria. Russia and the West: Where did it all go wrong?